Harkness Montessi was a treasure hunter turned monk turned monster slayer during the 10th Age. At the ripe age of fifteen, he set off with an tomb raider known as "Rabid" Rob Robair, to seek his fortune plundering ancient ruins. After close to two decades working together, the pair unwittingly unleashed a fiend named Turaskian J'ten who had been imprisoned during the 6th Age. While Rob was slain, Harkness was found by monks at the nearby Monastery du Priles and joined where he recovered. Plagued with nightmares of the fiend, Montessi spent his days tending their gardens and his nights studying an ancient bestiary he discovered in the Monastery's library detailing the history, habits and weaknesses of monsters of all kinds. Harkness began to realize that he was tired of cowering in fear and now had the knowledge to hunt and destroy these terrors that plagued his world. 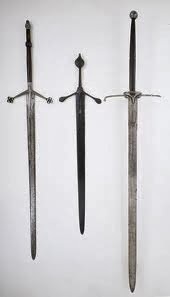 But first he would need weapons to aid him in his quest and it was then that Harkness Montessi set about having the monks help him craft three swords whose legend would live on for untold Ages. Default bonus: Attacks and damage when using the weapon: +1 (adventurer); +2 (champion); +3 (epic). Quirk: Complains it's freezing, unless it's within 10 feet of an open flame. Shroud (melee weapon): You deal an additonal 10 damage to undead you hit with this weapon (champion: 20; epic: 30). Quirk: Insists on saying a prayer over fallen foes. Thunderbolt (melee weapon): While the escalation die is odd, you deal +1d8 lightning damage whenever you hit with this weapon (champion: +2d8; epic: +3d8). Quirk: Brags to you where lightning is about strike, precisely 5 seconds before it's visible to you.